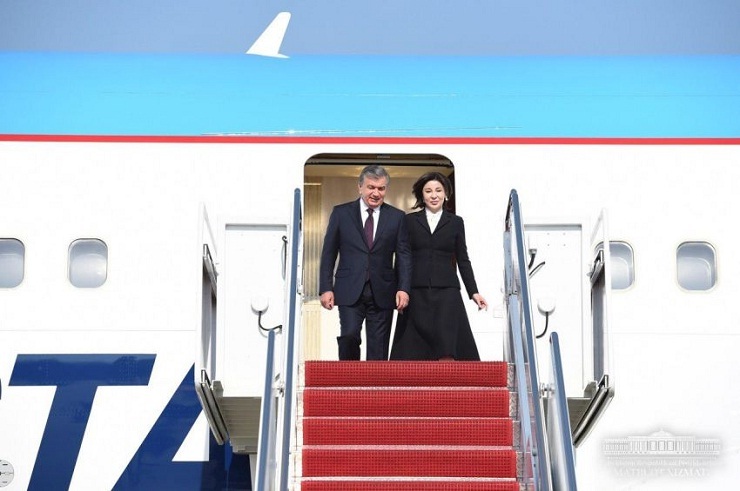 On May 15, 2018, the President of the Republic of Uzbekistan Shavkat Mirziyoyev arrived in Washington, DC at the invitation of the President of the United States of America Donald Trump. Officials of the USA met the President of the Republic of Uzbekistan at Andrews airport, in Maryland. Both sides pay great attention to this visit. The US administration valued the visit of the President of Uzbekistan as a historic one. The main events of the visit will take place on May 16-17. On May 16, President Shavkat Mirziyoyev will meet with US President Donald Trump at the White House. In the beginning, negotiations will be held in a narrow circle, then in an expanded one. As previously reported, during the high-level talks, it is planned to discuss the state and prospects of development of Uzbekistan – American cooperation, exchange views on current international and regional issues. The Head of the state will also hold bilateral meetings in the U.S. Congress, the Ministry of Defense and the U.S. State Department, as well as in the World Bank. Following the official visit, it is expected to adopt a Joint Statement of Presidents on “Uzbekistan and the United States of America: the beginning of a new era of strategic partnership”, sign more than 40 documents envisaging further strengthening of bilateral relations in various fields.